Three grinning faces crowd together at the bottom of the screen, the angle tilted just enough so that the majestic Eiffel Tower looms above their floating heads in the background. Kccch goes the simulated sound of the shutter opening and closing. Kccch. Kccch. They take a few more. A nearby cluster of tourists snaps their own shots – smiling, then cross-eyed, then tongue out. Le Champ de Mars is pixelated with huddles of selfie-takers. A wheedling tour guide urges them to follow her back onto the bus so they can visit the next landmark, and still no one looks up from their smartphone mirrors. After all, who really cares about landmarks? The tourists have their backs turned towards this one, if that’s any indication. But it wasn’t always this way. Once upon a time, people used to marvel at the world around them and take pictures to document its beauty. That was before they became so hung up on their own. Taking pictures of oneself might not be a new phenomenon, but the current compulsiveness surrounding the activity is. The invention of a noun to describe this type of picture highlights its growing importance in cultural conversation. The word “selfie” recently graduated from teen jargon to proper English when it earnt its place in the Oxford English Dictionary as word of the year in 2013. (“Selfie: (n) colloq. A photographic self-portrait, especially one taken with a smartphone or webcam and shared via social media.”) Far from being a fleeting behavioural trend, the selfie is an OED-certified international fixation. Whether they be cropped, enhanced or #nofilter, selfies are everywhere. We stumble upon them at any point during the day, when we trip over engrossed selfie-takers while walking down the street, when we flip through magazine pages of Taylor and Selena leaning into the same screen frame, and when we scroll through our cousin’s embarrassingly extensive collection of new hairdo selfies on our Facebook newsfeeds. The explosion of the selfie fad, spurred on by the example of stars like Ellen and Bradley, has added a new dimension to photography. In some respects, selfies are the latest development since digital: not only can we view our pictures on our camera immediately after taking them, but we can now self-edit before the images are even captured. Selfies have transcended the limitation of the viewfinder, allowing us to figuratively stand on either side of the tripod and angle the lens as we think it most flatters us. We are both the artists and the subjects. Our phones give us the option of adding filters, changing the exposure, and uploading to social media with one quick click. But the selfie’s revolutionisation of photography is not without its drawbacks. Social media has galvanised a mounting preoccupation with self-image, as people typically take selfies with the intention of posting or sharing them with their indefinite multitude of “friends” or “followers”. This intention completely diverges from the original purpose of photography. We used to take photos of the world around us for ourselves, but now we take photos of ourselves to share with the world (and more specifically, the “worldwide web’”). It’s painfully apparent when an overzealous selfie-taker stands with her face to her phone and her back to an important landmark like the Eiffel Tower that she is trying to enhance her Facebook profile rather than her cultural appreciation. Instead of adding an Instagram filter to make your eyes bluer or your skin tanner, you can boost your online image by squeezing evidence of the cool places you’ve visited into the background of your selfies or perhaps adding a geofilter on your Snap Story. As long as your face is the distinct focal point of the picture, it will still send the same message: You look good, your life is cool. Even the goofy ugly-face selfies that we post on social media, while they seem to be an exception to our goal of boasting our attractiveness, serve to increase our coolness factor. ‘Look at me!’ those pig-snout selfies seem to shout. ‘I’m so comfortable with my appearance that I can publicly humiliate myself and act like I don’t care what people think of me! But I really hope everyone sees this and thinks I’m self-confident and funny.’ The truth is that we wouldn’t post any selfies on social media unless we were looking for public approval, as measured by the amount of “likes” or “followers” we amass. Social media has trained us to care immensely about our image, and selfies have exacerbated this anxiety by giving us total control over how we look in pictures. It’s no wonder that our grandparents call us narcissistic. We’ve been socially conditioned for excessive self-promotion. The recent invention of the selfie stick has augmented this tendency to self-promote, while also contributing to our perilous unawareness of our physical surroundings. An effective arm-lengthener for the ultimate selfie aficionados, the monopod was listed as one of Time magazine’s ‘25 Best Inventions of 2014’ for ingeniously making it possible to take selfies from an additional two feet away. Gone are the days when awkward upper arms extended out from the corners of our selfies. Now the photo will show no evidence of strain from the effort to cram everyone in; it will look exactly as if a third party bystander snapped the shot. Since the gadget has become popular, museums and concert halls around the world have banned usage of the stick on their premises. Museum curators fear that tourists will inadvertently damage the artwork with their cumbersome new appendage, and concert hall managers are trying to protect audience members from whacks to the head. Although these bans have not proven very successful, the reasons for which they were put in place speak to an underlying problem with selfies. Our hyper-consciousness of our digital self-image diminishes our self-awareness in the real world, to the potential detriment of people’s physical well-being and the Uffizi Gallery’s priceless collection of Botticellis. What will it take to convince people of the fact that selfies are making us both excessively self-conscious and unconscious of the world around us? Just the other day I stood on the curb and watched a girl in her mid-teens step into the crosswalk against a red light. Entranced by her reflection in the glowing screen of her iPhone 6, she was puckering her lips and making a duck face at the camera until a panicked driver’s honking horn snapped her out of her hypnotised state. Jumping back to the sidewalk, she resumed her scrunch-lipped expression, dangerously determined to perfect that duck face. Our culture is set on autofocus with the lens turned inward. In the most extreme cases, our self-absorbed obliviousness could land us in the middle of an intersection against oncoming traffic. 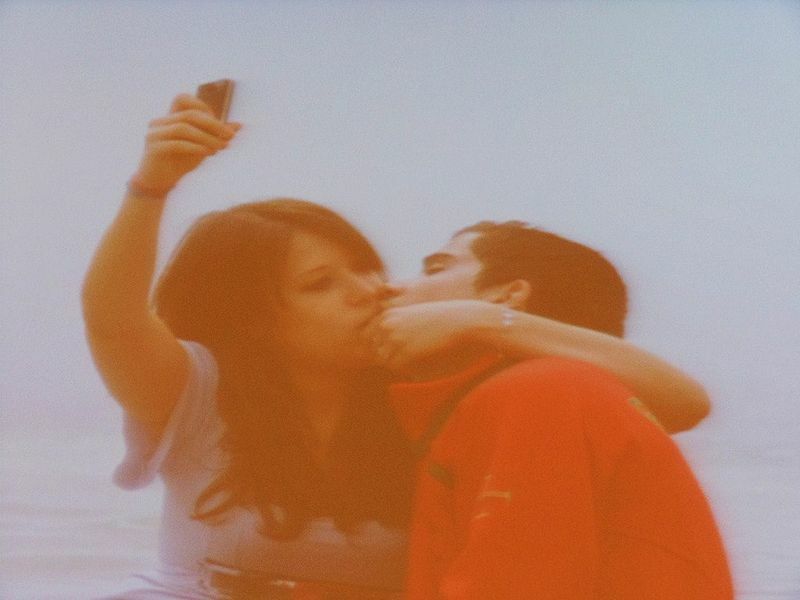 But apart from the physical harm that could potentially result from inattentiveness, our selfie complex is fostering a culture of self-criticism and obsession with self-image. Our desire to control how we appear in pictures has simply gotten out of control. For the sake of protecting our self-esteem – and our lives – we should use the rear-facing camera on our iPhones for a change and, if we’re feeling especially bold, let someone else take the picture once in a while. Born and raised in New York City, Gabriella Borter currently lives in New Haven, Connecticut where she is studying English at Yale University. When she is not writing, Gabriella enjoys running, travelling, and reading (just about anything). Yawn. Time to support each other and enjoy things for the sake of enjoyment. Not hard to just relax and let people live without judgement. It’s boring and cliched to roll our eyes and think ourselves so intellectual just because we reject what’s new. Times have changed and we’ve embraced the extras technology has afforded us – even if it’s a photo op with someone we care about, or just to admire ourselves and feel good about ourselves. That point of view sounds bitterly self conscious. And so, so tired. There’s nothing groundbreaking about elitism, and frankly, no one has the time of day for it anymore. We have the baby boomers to dish that out. Plus, we all know people sat for hours on end just to get a self portrait painted! Lighten up and drink a beer. I did have a chuckle though – if you think selfies are a “fad”, you’re going to be mighty disappointed! This entry was posted in Culture, Featured, Opinion and tagged Culture, Opinion, selfies, social media. Bookmark the permalink.